CTV offers state of the art facilities and equipment for producers who do not own or choose to use their own equipment. CTV offers two fully equipped TV studios and on-site installations at the large & small assembly rooms in the City/County Building for government meetings. Our studios offer ample space for interview formats, multiple cameras, professional lighting and audio mixing. They are also equipped with camera switchers that allow producers to create network style virtual sets, balanced audio, and integrated character graphics. 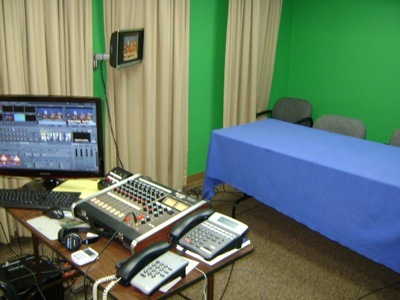 One studio is even equipped to allow viewers to call in during live programs. For remote shoots, CTV provides the use of advanced digital video cameras, microphones and portable lighting kits. Using our digital editing software, video can be transferred from almost any format for editing. Community residents can submit finished programs that were created using their own equipment, or they can create programs using CTV equipment after they have completed appropriate production training workshops. Depending on the number of people involved in a production, the cost for producing a regular weekly TV show on CTV can be as little as $20 per year – that includes complete access to our facilities & equipment and any training that may be required. Some local 501(c)(3) nonprofit organizations may also qualify to receive hands-on staff assistance in directing their programs at no extra cost. 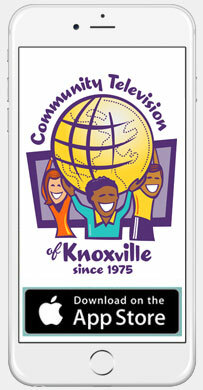 Through established relationships with the City of Knoxville & Knox County government agencies, CTV provides live coverage of local government meetings and produces other government programming at no cost to these agencies. Government and qualified nonprofit organizations can also subscribe to use our Community Events Calendar to promote their events. Producers may reserve equipment by phone or in person. All equipment is reserved on a first-come, first-served basis. Each producer is responsible to see that the facilities they use are left in good order and that they report any equipment malfunctions to CTV staff. Any producer checking out equipment must sign an agreement accepting financial responsibility for any equipment, which is lost, stolen, or damaged while in his/her possession. Persons under the age of 18 must be under adult supervision at all times while in the CTV facilities or using CTV portable equipment. CTV reserves the right to adjust equipment use policies based on user demand and the general technical health of our production equipment.